On January 28, the biggest movie star in the world heads to the Sundance Film Festival for his latest world premiere. 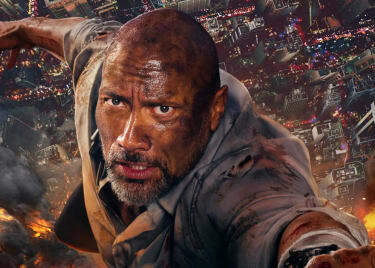 The star, of course, is Dwayne “The Rock” Johnson, who plays himself in the funny, uplifting wrestling movie FIGHTING WITH MY FAMILY, coming to AMC® on February 14. Up-and-coming actress Florence Pugh and Jack Lowden star, along with Vince Vaughn, Lena Headey (“Game of Thrones”) and SHAUN OF THE DEAD’s Nick Frost. In advance of the film’s Sundance bow, AMC spoke exclusively with director Stephen Merchant, whose work in front of the camera and behind the scenes on Britcoms like “The Office” and “Extras” has been causing people to fall over laughing for years. How do you feel about having your world premiere at Sundance? It’s a huge thrill for me. I’ve never been to Sundance. I only ever wanted to go there if I could take a film with me — in a couple of canisters, old school. It’s a great thrill that they invited us, really. 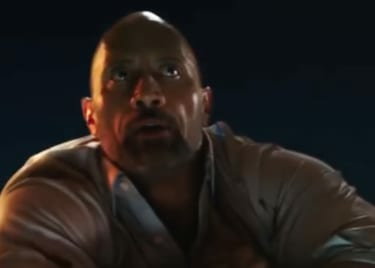 It’s the first time Dwayne’s gone there. Although it’s not what you might term a typical Sundance movie, it was certainly made as an independent feature. It was real guerilla filmmaking, though it was subsequently bought by MGM and Annapurna. We had a lot of the limitations and toughness of shooting and the independent spirit that you would get in a lot of [more traditional] Sundance movies. We just happened to also have the biggest movie star in the world. What are you looking forward to about Sundance? Not the cold, I assume. Well, I come from London, so I’m used to that. I’m a film nut. That was my first love. There’s an offshoot of Sundance in London, which I went to a couple years back, but this is my first experience of the official one. I just love being around movies and movie fans and people who talk about movies and are passionate about them. I hope I’ll get a chance to see other stuff, although I think probably our schedule’s a bit tight. To me, it’s just the atmosphere of being in an environment where people share this passion. It’s like people who go to Comic-Con or anything else. It’s an opportunity for die-hard fans to breathe in movie air. Most of the work that you’ve directed has been on TV. Why is FIGHTING WITH MY FAMILY the sort of thing to see at a movie theatre with a big crowd? I’ve worked very hard to make it a cinematic experience. In the audiences we’ve shown it to — and we actually tested it with American audiences before British ones — there was a great energy in the theatre. There was a real feeling of people getting behind Paige and behind this family. Real cheers in the high moments and joyful tears at the end. A real uplifting energy, which is what we were shooting for and that I was really pleased we got. I think there’s something about the shared experience that helps generate that. It’s the combination of being in a room where there’s laughter when there’s jokes, and then there’s a leaning forward in your seat when things get dark and desperate. And the triumphant, fist-pumping nature of the ending. I also think, because there’s theatricality to wrestling and a dynamism to the wrestling sequences, for me [the film] has a nice, kinetic big screen feel. I’ve shown it to audiences on both sides of the Atlantic, and it was a really great energy during the film. In fact, the biggest compliment I had was that one of the people who worked at one of the movie theatres when we tested it said, “Nobody went to the bathroom during your movie.” That doesn’t happen very often. That’s the highest praise, to me. Did you learn any wrestling moves? They were asking me to. And I was tempted, but — I know people who are going to Sundance, and they’ll go on the ski slopes when they’re not watching movies. And they say, “Will you do that?” Definitely not. Because I’m 6’7″, and I will almost certainly snap one of my giant, long legs, and I’ll be in a giant plaster cast for six months. I felt much the same way with wrestling. Everyone kept inviting me to do it, and I just thought, “I’ve got too many responsibilities on this movie.” I can foresee myself being in a wheelchair while we’re trying to shoot in the Staples Center. That wasn’t going to be a good idea. So, I’m afraid I was a coward, and I didn’t do it. I was tempted, because it actually looked quite fun in many ways. Although, I still came up with my own wrestling name. I would dress as Shakespeare, and I would have a quill, and I would be known as the Merchant of Menace, a play on “The Merchant of Venice.” So, I’ve got all that figured out. I just don’t have the moves. 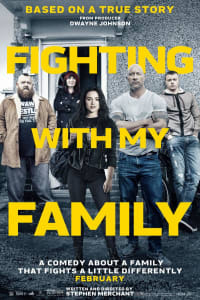 FIGHTING WITH MY FAMILY comes to AMC theatres on February 14.